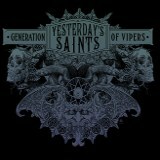 Yesterday's Saints' first LP is something I don't like a whole lot at the moment, but which shows promise in the band. There's a modern vibe to it that is hard for me to be comfortable with, and the subject matter, a concept album about the history of humans descended in direct lineage from Satan, is awfully ambitious, more so than a band like this can take on with success. But they're so enthusiastic about their material, and the band is so tightly focused and together, that it's hard not to be entertained occasionally, even when their ability to write a tune can't measure up to what they want to do with it. The music's mostly melodic death metal, heavy on the death, tightly-wound and very -- too -- drum-heavy. It's noisy music, with a sharp-edged, digital-sounding production, with vocalist Matt Rice using different vocal styles for his characters: Harsh death metal vocals for Lucifer, a grim but clean voice for the angels on the side of God. Fall of the Ancients is a great start to the album, and though I'm not crazy about the almost-tuneless chorus, the riffing is energetic and strong; I just wish there was more complexity in tunes like Origen Adamantius than the chugging bludgeoning that the listener receives, because there's a lot of potential here. What Yesterday's Saints lack in cleverness they make up in dramatics, though; Sangreale drops everything about their melodeath approach and moves to a soft ballad with Rice singing the whole thing clean. Here Lucifer, seducing Eve, keeps his voice nice and quiet (think Warrel Dane in his Nevermore role) till he shows his true colors and switches to a roar of triumph. Cain's Agony is good too, but that may be for the same reason that most of the melodeath parts blend together; that many over-miked blast beats with that much guitar chugging can't help but sound pretty generic even if played well. The lead guitar redeems this a bit. The Divine Tragedy is not an interesting song, but Witt Black knows how to write a good melodeath solo. If only the rest of the songwriting was better, as there is more tunelessness and it comes perilously close to cloning Fall of the Ancients. The final track before the instrumental is supposed to be about the brood of Cain in the present day and in the future; the lyrics are a confused mess that seems intentional, given their content, and like The Divine Tragedy, this is a good guitar solo wrapped in a rather mediocre song, though the chorus is slightly better. If you liked Avenged Sevenfold's recent albums, such as City of Evil, it's quite likely that you'll like this one, and if you think they're strictly mallcore, you'll probably think this is too. I'll be a little kinder than that, though. Yesterday's Saints have some good ideas and appear to be good musicians; they just aren't great at executing those ideas without writing choruses custom-made for the Hot Topic set. If they turn down their drum mikes and figure out how to write better melodic hooks, they are likely to do better. Until then, it's probably a good idea to pass Generation of Vipers on by.